Each week, Voice of Russia hosts Red Line, a discussion about the events of the week, as seen from Moscow. This week, movement in Libya, the 20th anniversary of the August Putsch, and Kim Jong-Il. Ekaterina Kudashkina: This week we will start with the events in Libya, where a military standoff between Colonel Gaddafi’s loyalists and NATO-supported rebel forces reached its climax after six months of deadlock; then we will mark the 20th anniversary of another revolution – the failed coup of August 1991; and finally, our Face in the News is North Korean Leader Kim Jong-Il, who paid a visit to Russia this week. Now, Beyond the Headlines – this is our first heading in which we will discuss the latest developments in Libya’s ongoing revolution, or civil war, if you prefer. All eyes are fixed on Tripoli, where opposition forces are still trying to suppress remaining pockets of resistance, while the whereabouts of Libya’s strongman remain unknown. Sergei Strokan: To me, the latest developments in Tripoli look like the delayed, though inevitable, agonizing death of Gaddafi’s regime. I realize that a lot of Colonel Gaddafi’s admirers here in Russia (both in open and in secret) will disagree until the very last moment. However, I see no way for him to regain control of the country. Sergei Strokan: My question is: What next? Can we expect that “dignity and freedom” will prevail over Gaddafi’s “state-sponsored terrorism and oppression”? Or will one utopia be replaced by another, still more sinister, more inhuman? Ekaterina Kudashkina: I am not sure that the end is going to play into the hands of the international coalition. 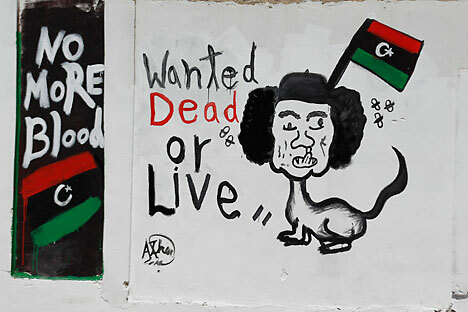 Gaddafi is going to be remembered like a true hero who resisted his enemy ‘til the end. Mira Salganik: For a while the image might persist, but then it depends on the further development of Libya. Sergei Strokan: I have my strong doubt that he might be an icon. Regardless of whether NATO was there or not, I believe that at any rate, regardless of what is going to happen to him, whether he is captured or whether he is killed in action, under no conditions will he turn into an icon for tens of thousands of Libyans for the simple reason that they are fed up with his rule. Mira Salganik: But a similar number are still in love with him. Sergei Strokan: I think he will be to the liking first of his clan obviously and to the narrow group of military elite whom he paid. Ekaterina Kudashkina:I am quite positive that you are missing the situation on the ground, because otherwise, if your assumption had been true, there would have been no six months of stalemate in Libya. Ekaterina Kudashkina: Let’s shift the focus to post-war Libya or, rather, to post-Gaddafi Libya, as I am not sure that the war is going to end with the fall of Gaddafi. Anyway, will “liberated Libya” escape the fate of “liberated Iraq”? Or is it heading to a dark age of chaos, clan and religious strife with Al-Qaeda operatives turning it into their new homeland? Sergei Strokan: The future of post-Gaddafi Libya will be determined by several key factors. First, obviously, a lot will depend on the new authorities, whoever comes to power, on their ability to quickly end the hostilities, to announce a national reconciliation program, and a lot depends whether they will allow former Gaddafi loyalists, people who are still fighting in the streets now, to integrate into the new reality. It would be the first step to election and creation of new legitimate government. Mira Salganik: The goal is not at all unrealistic, though it is going to be extremely hard to achieve that kind of consensus, and not only because there is no unity between Gaddafi’s loyalists and the opposition, but even among the former rebels themselves. Sergei Strokan: By the way, Russia’s President Dmitry Medvedev while meeting North Korean leader Kim Jong-Il this week, hinted that, “If the rebels have enough strength and opportunities to unite the country for a new democratic start, then naturally, we will consider establishing relations with them." This week there were a lot of speculations, misinterpretations and distortions as to what would be Russia’s policy towards new Libya and to what extent Moscow’s interest will be affected. A section of international and regrettably Russian media was quick to announce that Moscow stands to lose a lot as winners “will not forgive” the Kremlin for not unequivocally recognizing the rebels’ National Transition Council, the way the France did, at the earlier stage of the conflict. Some media outlets went even further by quoting certain “Libyan sources” as saying that Russia’s leading oil and gas companies will be deprived of the right to secure their former positions on the Libyan market. Mira Salganik:I am sure there are some people who would like to see Moscow lose its position, but I think this is sheer bull. Sergei Strokan: I don’t know what brings such speculations to life – sheer ignorance or deliberate scheming. But I think it is time to recall that it was Russia’s decision not to use its veto right in the UN Security Council while voting on Resolution 1973 this February that allowed the NATO coalition to launch its campaign in Libya and probably save the lives of the current Libyan critics of Russia’s position. If Russia just used its veto, there would be no NATO operation in Libya. Contrary to popular belief, I think that by not taking sides in Libyan conflict Moscow secured an important political victory; Russia secured its future role as a mediator between Gaddafi’s loyalists and opponents – a role Western powers can hardly take. Russia can definitely facilitate inter-Libyan dialogue, though this will be an uphill battle, of course. Ekaterina Kudashkina: What are the conclusions the international community should draw from the Libyan case? We discussed this issue with Lieutenant-General Gennady Yevstafyev, an expert in international security. Gennady Yevstafyev: It appears that the Libyan game is almost over and it gives us a chance to draw certain conclusions from what has happened in the last four months. Among those conclusions there are some very important ones. The first conclusion is that the victory for the West in Libya became possible only by creating a very unnatural coalition between NATO and extremist Muslim forces and a small amount of liberals that are very unnatural for Libya. So, it clearly shows that when there is a need, NATO can make deals with anybody in order to promote their aims and achieve the necessary results. The second conclusion that we can draw from this situation is that there is a brand-new situation with cyber attacks. Maybe for the first time in the recent history we see a tremendous amount of cyber attacks and disorganization of the internal life of the whole state. States that are not very developed must take note of this, because it appears that cyber attacks were extremely effective and they really created a very explosive situation in the country. The third conclusion is that the democrats of NATO are quite capable of rethinking international decisions. The Security Council resolution allowed the establishment of a no-fly zone over Libya, but they have interpreted this mean a “NATO-only fly zone,” and then they openly helped one party in the internal conflict and bombed the government of Gaddafi. I do not sympathize with him, but we have to admit that only recently the West dealt with him like with an officially recognized political force. That means that when supporting certain UN resolutions we have to think in broader terms and look more carefully into the possible consequences of supporting certain resolutions. I believe that the position of Moscow as far as the other Islamic countries of the Middle East are concerned, we now understand that it is not only the problem of atrocities, but it is now very clear that the war was for Libyan oil, and in this sense, we have to watch carefully. Among the countries that suffered from this unprecedented use of force against the Libyan state is Russia, which lost about $4 billion of possible contracts with Libya. This is the situation that brings us to the conclusion that NATO is an organization that cannot be relied upon in certain situations, and we cannot have confidence in this organization when it comes to its own interests. Ekaterina Kudashkina: But how would you assess the rapid progress, which was actually made in only a week’s time? Just a week ago, everyone was saying that the Libyan opposition is so disunited that during the previous six months of the NATO operation, they still failed to achieve any progress whatsoever, and now we see a rapid progress just in a week’s time. Do you think that there could be some involvement from external forces? Gennady Yevstafyev: I would make a point, and this point has a historic parallel. When Saddam Hussein was thrown out of power during an open military operation by the Americans, everybody was also surprised how fast it occurred, but there was no secret about that. The United States, the Western countries operate not only by military force, but mostly they operate by buying certain crucial figures of the regime with which they fight, by giving them money and allow this money to be spread among their subordinates. I am sure that in this particular case there was a tremendous amount of money thrown into the last week’s operations through which they managed to buy a number of crucial military people in Gaddafi’s military establishment. The other reason was that they have intensified their bombardments and there is a suspicion that NATO units took direct part in attacking the vital installations of Gaddafi’s regime. Ekaterina Kudashkina: And now I suggest we move on to our next section, Between the Lines, in which we usually discuss what we believe to be the most noteworthy newspaper story of the week. This time it is an article by Mikhail Gorbachev, the former – and the only - Soviet president, entitled “Lessons from the USSR coup attempt” and published by The Washington Post. This piece is his recollection of the attempted coup of Aug., 19, 1991 ‑ which is also known as the August Putsch - and another attempt by the former Soviet leader to explain what happened 20 years ago. First let me quote the story: “Twenty years ago,” Mr. Gorbachev writes, “a group of Communist Party Politburo members and Soviet government officials attempted a coup d’état. They created an unconstitutional ‘committee on the state of emergency,’ [GKChP ] isolated the Soviet president and removed him from power. The events of that August were the result of fierce political struggle during the final stretch in our efforts to reform the Soviet Union. I’m sure each of you has your own personal memories of GKChP. Do you think you could share them with us, too? Mira Salganik: I do not think my personal memories are worth describing at all, but I want to say that 20 years seems to be a long time for my country. Of course the memories are blurred and things have changed, but there is one thing which remains alive, and that is a lot of animosity towards Gorbachev. One of the causes of this animosity is that he is always accused of sort of tacking up of the Soviet Union while the contrary is true. Just now, when you have read his autobiographical account, he says that telephones were switched off at the moment when the Union Treaty was ready to be signed. It was not him who was thinking of dismantling of the Soviet Union, the contrary is true. Sergei Strokan: We all had high hopes, all of us. The dominant feeling was that we had just to stand up to protect the democratic reforms started by Gorbachev. It was a good time, you know, the media was suddenly open to all sorts of debate, Communist Party administration was replaced by elected governing bodies, new parties appeared. No one wanted to lose that freedom. Ekaterina Kudashkina: We started with saying that people tend to forget. Well, a term of 20 years is, roughly, a generation. According to the Levada Center’s latest poll, only 10 percent of respondents said that the suppression of the August Putsch in 1991 was a victory of the democratic forces, which put an end to the rule of the Soviet Communist Party. Mira Salganik: According to what Gorbachev said in his radio interview, recently there was another opinion poll and people were asked whether they regret for this disintegration of the Soviet Union. The overwhelming majority said “yes,” and its no wonder. In the years that followed, living standards went down dramatically – that’s enough for many people to be unhappy. But that is one aspect. I want to say that it was not really a demand for democracy; it was the protest of what the Soviet Union was before Gorbachev – of suffocating oppression. I would like to add another thing, as for what we called national republics and now the independent states, the number one issue on their agendas was not democracy, but national freedom, national culture, national language, national everything. Ekaterina Kudashkina: I also think there was some misconception of democracy, democracy is a responsibility and responsibility is really a burden. I am not sure that all of those who demanded democracy were prepared to carry the burden of democracy. Mira Salganik:I fully agree with you, but in the Soviet Union the question of responsibility did not arise in people’s mind; it was the state that took on the full responsibility. There was no question of responsibility; your responsibility was to follow instructions from above – the results of this are still obvious now. Ekaterina Kudashkina: Reality is more complex than it seems. Now I suggest we listen to someone who is both a witness and a researcher into the 1991 coup. Please meet Dmitry Babich, a political observer for RIA Novosti News Agency. Mr. Babich, I saw your very interesting piece on the RIA Novosti website. You have done substantial research on the issue? Dmitry Babich: This is only partially true, because when the events happened in August 1991, I was a journalist at Komsomolskaya Pravda, which was the biggest newspaper at that time. I was still pretty young, I was 20, I just went to the White House, I saw what was going on around it and then in the following 10 years, I took interviews from almost all the members of GKChP, the Committee on Emergency which was indeed behind the events that were represented as a coup, but which was partially a coup and partially something else as I found out later. Ekaterina Kudashkina:What do you mean by that – “partially a coup and partially something else”? Dmitry Babich: I would say that obviously Mikhail Gorbachev, the president of the Soviet Union at that moment, knew that something was going to happen and probably he knew about the plan of the GKChP. In fact, almost all of them were very close to him, he was in contact with them and when they came to visit him on the eve of the coup he told them something like “To hell with you, try it,” he did not deny it. So, obviously, the situation was more complicated than just a bunch of old communists trying to take power and a nice democrat isolated and fighting back with people supporting democracy in Moscow. I would say that the real story was a bit more complicated. The Soviet Union was already almost dead at that moment; the Union Treaty that was planned to be signed, it was going to be signed by only eight republics of 18 at best, probably less. So, in fact it was the last attempt of the outgoing Soviet bureaucracy to retake the power that had already slipped out of their hands. That does not say that Gorbachev was not a democrat; I think he was a democrat, and yes, he is not an ideal person, yes, he also thought about his own security, about his career, about his family – that is quite natural, he was not an angel or a hero. And also what happened, the people who came to the White House to defend the first elected Russian president Boris Yeltsin, I think these people were sincere, and I was among them. Ekaterina Kudashkina: But what could be Gorbachev’s interest in that coup? Dmitry Babich: Well, he was losing power, together with the old Soviet authorities. Already in 1990, the Communist Party was declared as just one of the parties, not the center of the system. Basically the power was already out of reach of Mr. Gorbachev. The world did not realize it and many Soviet people did not realize it because psychologically we still lived in the Soviet Union, but in fact the Soviet Union had died at least several months before it died officially in the end of 1991. Ekaterina Kudashkina: But then Mr. Gorbachev still quit after the coup? Dmitry Babich:Yes, if you analyze his behavior, he returned but he returned no longer a real president. Instead of joining the crowd and celebrating with them, he immediately went to his dacha. At the newspaper, we no longer paid too much attention to him; all attention was on Yeltsin, on the new Russian authorities, we knew that taxes were cut to the federal authorities. So basically, the Soviet authorities did not end with the revolution. Ekaterina Kudashkina: Which means that Mr. Gorbachev obviously lost to Yeltsin? Dmitry Babich: I think it was a part of a bigger scheme of a longer process. I am no fan of conspiracy theories, but the situation was the following: if you look at what was going on in the Soviet Union in the end of 1980s, there was the Russian or the Soviet elite, relatively young – active, cruel, cunning – and what did they get for all their efforts? They got three- or four-room apartments, old dated cars that were made in Western Europe 30-40 years ago, maybe one trip abroad once in two years, once in three years ‑ and that’s it. They thought that they deserved more, they wanted to live like Arab sheiks and now they live like Arab sheiks. The whole story was that this elite gradually changed the system, and the abandonment of the Soviet Union was a part of that scheme because it was just easier to get all these new resources without the Soviet Union than with the Soviet Union. If you look at the groups that gained most from the collapse of the Soviet Union, these are the elites of the former Soviet republics, now the ruling elites in the new independent states. Ekaterina Kudashkina: But moving on just to people in the street, you said that you were one of the crowd in front of the White House, so what was the sentiment? Dmitry Babich: I remember that when I came there on the night of the first day, Aug. 19, I met there my friend who was planning to go to study to the United States just several days afterwards and he was in despair because he thought that he would not be able to buy an air ticket now or he would not be given a visa to go to the United States. There were some people who were just fighting for their personal future, and there were others who were afraid of returning to the early 1980s, and there were some other people who were just angry and who thought that things were just going to get out of hand and who wanted more reforms in the economy, and they tied their hopes to Yeltsin ‑ there were all kinds of people there. On the other hand, just next to the White House, I remember we were driving with another correspondent from our newspaper to the White House in a car and we saw huge lines for vodka standing just a mile or half a mile away from the White House. Ekaterina Kudashkina: Vodka was distributed?! Dmitry Babich: It was sold at that time but it was very difficult to buy it, so you had to stand in a long line. So, there were people who were desperate to defend the White House and there were other people who wanted to buy vodka and to get by, for them it was just a regular day, for the majority of the population of the Soviet Union. I mean if you went out of Moscow, went to some other town or city, you would not see any kind of commotion in the street, basically it was a dramatic event, but the whole drama was concentrated in the corridors of power; the officials were desperately deciding what they were going to do and the elite was split. A part of the elite realized that the Soviet Union was going to collapse, so it was ready to join the winners to participate in the division of the spoils, and there was an old elite, that was basically represented by GKChP, that just did not realize in time that the Soviet Union was going to be abandoned; later on this elite made up the Communist Party of Russia and their partisans in the new independent states. Ekaterina Kudashkina: Do you feel that the aspirations of that crowd in front of the White House were met over the years? Dmitry Babich: I think the majority, of course, did not get their aspirations fulfilled. That friend of mine went to the United States, he studied there for three months, now he works with a huge Western news agency, he even managed to get a position outside Russia ‑ a very rare event for anyone working for a foreign media, because, I do not know what the situation is now, but in the 1990s when almost all of my friends worked for foreign media, including me, we had a very clear ceiling of how much we could achieve working for foreigners – and obviously, the ceiling was not very high, but he managed to get by. But the majority wanted a more fair society, they wanted more social justice, and certainly they did not want oligarch capitalism, and certainly they wanted free elections and more democracy in the companies, more democracy in their daily life. Unfortunately, 90 percent of these aspirations were never realized. Ekaterina Kudashkina: And now I suggest we move on to our final section, Face in the News. This time it is North Korea's leader Kim Jong-Il, who recently visited Russia for the first time in some 10 years. Sergei Strokan: Russia is one of the countries he visited as part of his recent program aimed at expanding North Korean diplomatic ties. Mira Salganik: So did he arrive to ask for help? Sergei Strokan: I think rather for political and diplomatic support. Mira Salganik: But sanctions have been in place for a number of years, and up until very recently North Korea was acting quite aggressively, both in word and in deed. Do you have any idea what is the reason for the recent change? Sergei Strokan: Well, there’s the issue of succession that we have to keep in mind. Kim is anxious to convince Russian leaders that his third son, Kim Jong-Eun, is strong enough to rule. That could explain why he finally decided to take his armored train to Russia, like he did back in 2001. So, this is his first visit after a decade. Ekaterina Kudashkina: Well, Stratfor analysts say Kim Jong-Il is preparing the country for the so-called Juche 100 celebrations. Those celebrations are going to begin with Kim Jong-Il’s 70th birthday in February, then, in April they are going to mark the 100th anniversary of his father Kim Il-sung, who died in 1994. One of the elements in that is to try to find a way to strengthen the North Korean economic system, creating pockets of economic activity that can increase the amount of money to the country, they also want to find a way to end the Korean War, which is not officially ended yet, to have a peace accord with the United States and ultimately to have diplomatic relations with the United States. So, in other words, they’re trying to improve investment climate to attract investors. They need to make at least some progress ahead of those celebrations. Sergei Strokan: Perhaps there is another reason behind his new openness to the world. He might be looking for ways to reduce the North Korean dependence on China. Mira Salganik: Are you referring to the gas pipeline deal? Sergei Strokan:Well, there have only been first negotiations and nothing has yet been decided or analyzed. He still needs to discuss it with the South Koreans, this is an important thing. Ekaterina Kudashkina: But he still needs aid to support the country’s economy. Getting back to where we started, the general notion that North Korea is a country inhabited with hungry people dressed in shabby clothes appears to be outdated. I recently ran into a story by Andrei Lankov who is an associate professor at Kookmin University in Seoul. It is a story about – guess who – the North Korean new rich. His basic point is that in the past 20 years, there was a slow-motion collapse of a hyper-centralized economy that was once a defining feature of North Korea's "nationalist Stalinism". “Grassroots capitalism,” he says, “has replaced state socialism and this quiet transformation predictably brought in a remarkable income inequality. North Korea's new rich made their fortunes amid the economic chaos and social disruption of the great famine of 1996-1999. This new bourgeoisie matured in the next decade as the North Korean economy started to partially recover from the disastrous 1990s.” And this is the first-hand information. Sergei Strokan:You mean to say, a new middle class? But that may pose danger for the Kim dynasty? Ekaterina Kudashkina:Not necessarily, because the revolution, according to Lankov, would bring on a unification with South Korea, and that is something the new rich would try to avoid. But anyway, that might improve the country’s economic standing and that, in its turn, is something that could secure the position of the Kim clan. Mira Salganik: And don’t forget, there is also the six-party talks on nuclear issues. Ekaterina Kudashkina: That’s right. Kim said Pyongyang was prepared to restart the talks without preconditions. But he already told that to the U.S. and South Korea and other negotiating partners. It still remains to be seen whether other parties would like to resume those talks. Sergei Strokan:Well, the format does not look to be particularly efficient. There was a missile test in 2009, and then in 2010 there was the sinking of the South Korean warship, and a lot of rhetoric. Ekaterina Kudashkina:Well, I heard an interesting account that might explain the turn. As you probably know, at the end of May this year Kim Jong-Il visited China – his third time in just over a year. Usually during his travels Kim Jong-Il stays one night in each city he visits. This time he traveled 3,000 kilometers for three days and two nights in his armored train to a small Chinese city of Yangzhou. There were all sorts of speculation why he did that, but our South Korean colleagues, journalists, really suspect Kim went to Yangzhou which is the hometown of Jiang Zemin, who is Hu Jintao's predecessor and still very influential Chinese politician, to meet with Jiang, which actually gives an impression that Kim seemed to have been seeking Jiang’s support in matters pertaining to economy, politics, succession and eventually ‑ the decision-making.